All Saint Night | Music | Style Weekly - Richmond, VA local news, arts, and events. St. Vincent is unforgettable at the National. Hilary Langford Annie Clark, a.k.a. 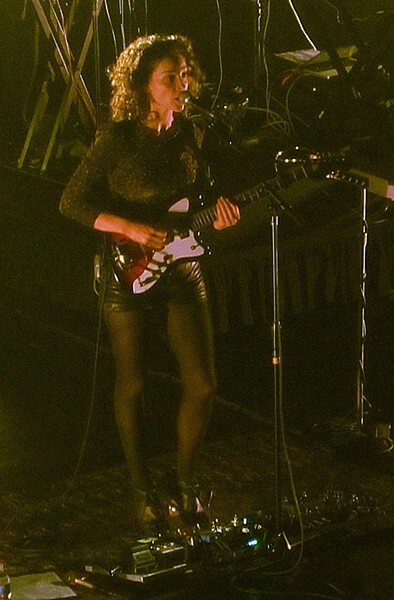 St. Vincent, at the National. St. Vincent, aka Annie Clark, writes provocative songs and makes acclaimed albums, but what she’s getting the most attention for lately are fiery live performances. Her stop in Richmond on May 24 was no exception and lived up to any and all hype. The 29-year-old and her band are a well-rehearsed unit of players whose sole purpose is to blow your mind. Watching St. Vincent play lends itself to an even greater appreciation of Clark’s idiosyncratic material. Many of the sounds you would chalk up to sophisticated synths and loops are in fact played by the dexterous player at dizzying speeds. Opening with “Marrow,” from her lauded sophomore release “Actor,” Clark eased into a 17-song set that showcased mastery of string and stage, but wouldn’t remain subdued for long. With spastic lights and color-kissed fog, the band pulled us down a delightfully mad rabbit hole where songs from the most recent album, “Strange Mercy,” oscillated between ferocious and fragile. "Cruel,” the poppiest of the lot, bounced carelessly in contrast to the stalking beats of “Year of the Tiger” and thrashing “Northern Lights.” The singer paused briefly to speak about the early days of playing shows in the area, writing a song with her mom, and “enjoying story time” at the Library of Virginia just up the street from the theater, but stayed mostly focused on the music. Following a cover of the Pop Group’s “She Is Beyond Good and Evil,” Clark hurled herself into the crowd and kicked out “Krokodil” in its entirety while being passed around the first three rows. Despite The National’s staunch policy against crowd surfing, no one seemed to mind as the crowd was more concerned with keeping the singer up and moving than getting too rowdy. While that moment wouldn’t be topped, the band returned to play the title track from the latest release and a searing rendition of “Your Lips Are Red” with yet another hearty dose of wicked riffs and intoxicating vocals. After almost 10 years, it was good to have Annie Clark back in the River City in a very big way.